The Diagnose Dual-Band toolkit is designed to bring simplicity and power to the process of wireless troubleshooting. 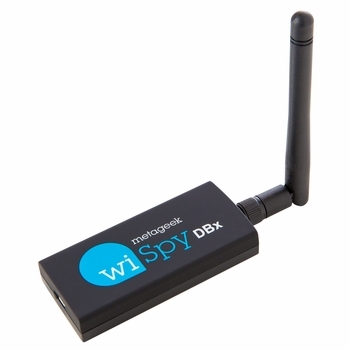 It combines Wi-Spy’s ability to read raw RF data with your computer’s built-in Wi-Fi card to show you how environmental Wi-Fi channel saturation and non-Wi-Fi transmitters are affecting your network. Attach the included Device Finder Directional Antenna to Wi-Spy to identify and locate an interfering device in the 2.4 GHz band. Chanalyzer is capable of displaying activity in the 2.4 GHz band, 5 GHz band, or both simultaneously if using Wi-Spy DBx or a Cisco access Point. Use the included Report Builder Accessory to generate full-color, customizeable PDF reports of your findings.